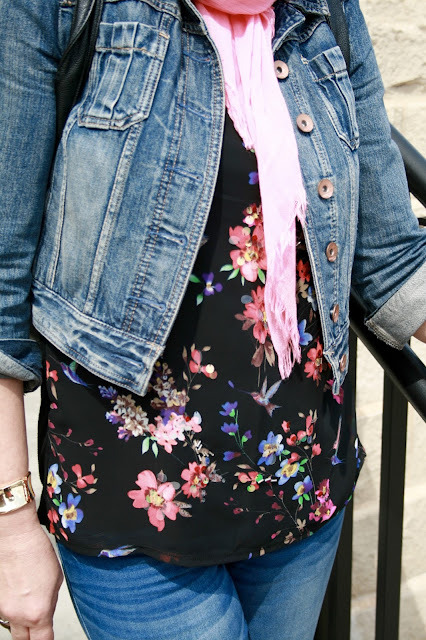 I'm continuing my "Spring Jacket" series with a denim jacket that you have probably seen over and over again because I've been wearing it for three years! In fact, this jacket was worn in my very first fashion post back in 2013 in this post HERE. For those of you new to this series, I decided to showcase all of my spring and fall weather type jackets since I had so many of them. Most of them I picked up at amazing deals. And today's jacket is the Cropped Denim Jacket! 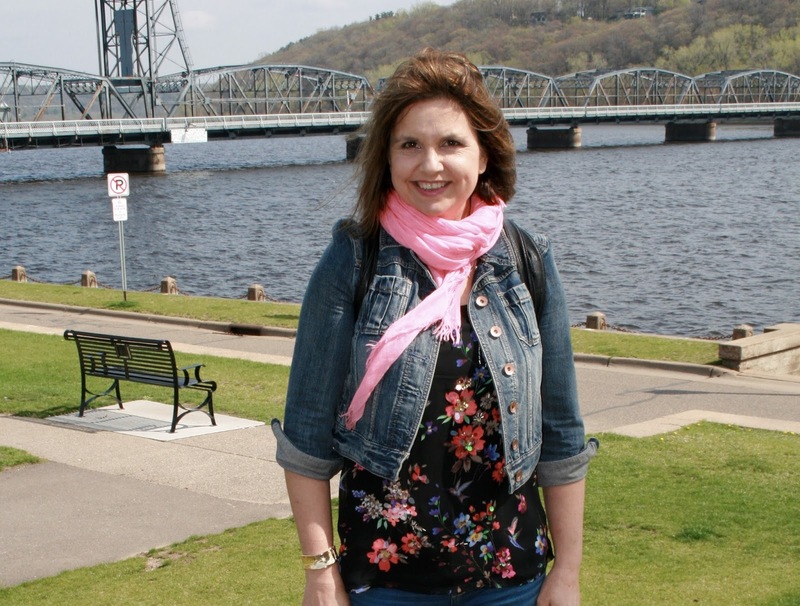 I wore this jacket on Saturday when my husband went to Stillwater, MN to do some antiquing. It was a cool day, in the sixties, and windy (as you could have probably guessed by most of the pictures). Because we would be doing a lot of walking, I used my backpack purse (old, Kmart), to carry a water bottle, snacks, and all the usual stuff that goes in my purse. Though it was a beautiful day, the wind was a bit nippy so I solved that problem by wearing a scarf. My top is an old tank top from Express. I've shown it you before HERE and HERE. It has sequins on it so it's so pretty and sparkly in real life. The tank top is so short, sometimes I think of it more as a shrug than a jacket. It actually is the perfect jacket to wear in the summer over a sundress or tank top when you need some extra protection from the air conditioning or a cool evening. Because I had a scarf on, and my hair covers my ears, the only jewelry I wore was a big gold bracelet. Although I love these shoes, they weren't my first pick to wear with this outfit. I wanted to wear a pump, but I went with these because I knew we would be walking all day and they are so comfortable. They are from Sears (old). The floral shirt has a solid black back. The jeans are also from Express (super old). I just read today on another blog that wearing a cropped jacket with a long top makes you look thinner. I never thought of that before, but I guess I would agree. I think I have about four more spring jackets I haven't shown you yet in this series. We will see if I get through them all. I said when I started this that I would do it only until the weather warms up. Of course, I have lots of fall jackets too...but I will wait till fall to begin that series! During my two week vacation in Florida we went to one theme park: Islands of Adventure. We picked this theme park because my daughter and son-in-law are HUGE Harry Potter fans and we wanted to see the Hogwarts Castle. Now we did enjoy the rest of the park as well, but I have so much to share on the Harry Potter section of the park, that I decided to split this week's travel post into two posts. This week I'll cover Harry Potter and next week I'll share what else we did at the Islands of Adventure. Now although my daughter and son-in-law have read all the Harry Potter books and seen every movie multiple times, I have not. I only read the first book, and saw just the first three movies. So to prepare for our visit to the park, we did a Harry Potter movie binge first! Yes, I watched every single Harry Potter movie! 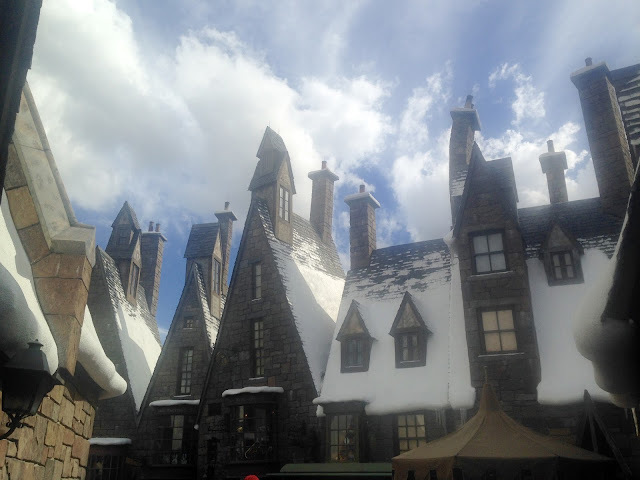 I wanted to make the most of my experience at the park, and thought I would appreciate everything more if I was more familiar with all things Harry Potter. And it worked! If your a Harry Potter fan or know someone who is, The Wizarding World of Harry Potter at Universal Studios in Orlando is not to be missed. Everything and anything went into building this spectacular attraction. Not a single detail went unnoticed...as you will see further on into this post. But first, let me explain a few things. There are two parks in Orlando that are owned and operated by Universal Studios: Universal Studios and Islands of Adventure. Now here is the catch: The Harry Potter attractions are located in BOTH parks. The castle and Hogsmeade Village are in the Islands of Adventure park, and Diagon Alley is in the Universal Studios Park. You can ride the Hogwarts Express to go from one park to another, but it costs an additional $50.00. Since the tickets already cost $100, we decided to just go to the Islands of Adventure since that was where the main attraction - the castle- was. 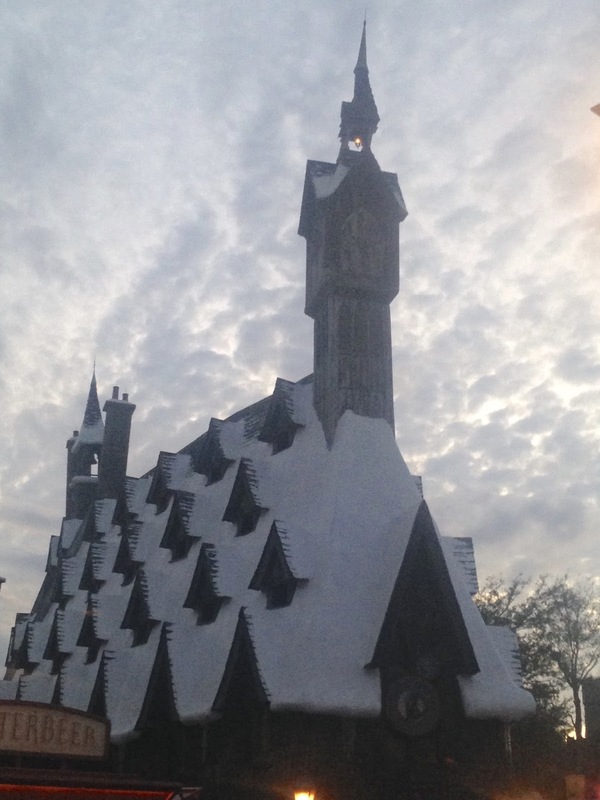 Here is the entrance to Hogsmeade Village in the Island of Adventure. To say we were beyond excited to be here would be an understatement. The village of Hogsmeade looked like it came right out of the movie. The attention to detail was amazing. 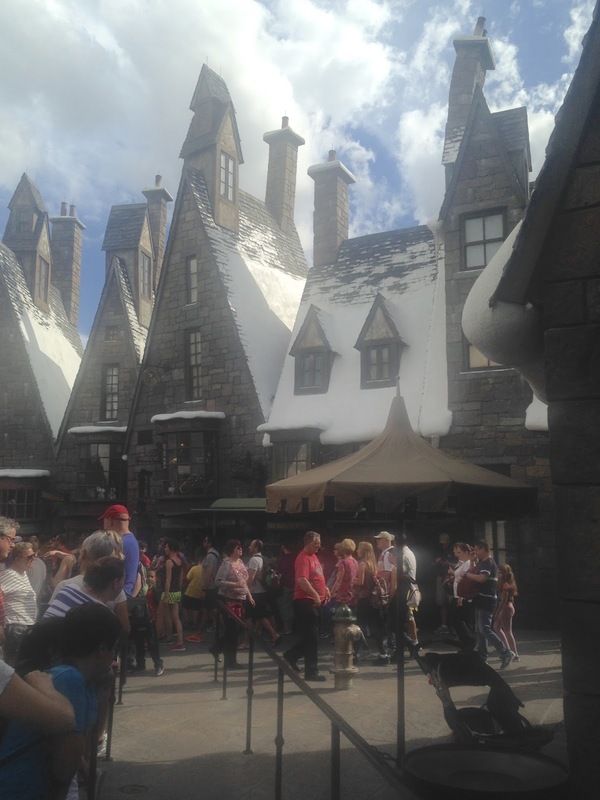 If it weren't for the crowds of people wearing shorts and tank tops (and we went on a slow day, during the off season), one would have thought we actually were in the actual world of Harry Potter. The castle exterior was mind-blowing! Just the sheer size of it was phenomenal, not to even mention all the intricate details of the windows, spires, and rock formations. Inside this castle is the ride "Forbidden Journey". This ride was so fun we rode it THREE times!!!! While waiting in line for this ride, you walk through the castle and trust me...you will not be bored because while you are 'waiting', your touring the inside of the castle. You get to see holograms of Harry Potter and his best friends, you see framed photographs that move and speak, and you see many other exciting rooms and objects that are in the movies. The Forbidden Journey ride was so fun! It is an actual ride that moves like a coaster and you experience the World of Harry Potter by becoming a part of it yourself! Your watching scenes take place, but because you are moving too...it feels like you are really experiencing it. You soar above the castle, as if you were part of the Quidditch game...you meet magical creatures like fire breathing dragons and other mystical creatures. It is such a blast! There are two other Harry Potter rides to be enjoyed at the Islands of Adventure: The Dragon Challenge and The Flight of the Hippogriff. Ashley and I did not dare to go onto the Dragon Challenge as it was a high speed roller coaster too intense for us, but Jason, a roller coaster lover, went on it not once, but twice! We did go on The Flight of the Hippogriff because it was described as a family-friendly roller coaster. It was mild, for a roller coaster, but my arm kept bumping on the side of the car and just look at the bruise I had the next day! Now, other than rides and the castle, visiting the village of Hogsmeade was the next best thing. As I stated earlier, the attention to detail in the construction of this village is mind-blowing. Every nook and cranny of this place was made to look authentic. They covered all the building tops with snow...and it certainly looked real to a Wisconsinite like me! Many of the stores and hang outs in the movies are in the village too. Remember Honeydukes candy from the train rides in the movie? Well, they made an actual Honeydukes candy shop where you can buy the fun candy in the movie like "Bertie Botts Every Flavor Beans". And just look at this train! I love how they piled a bunch of old suitcases and trunks right next to the train. 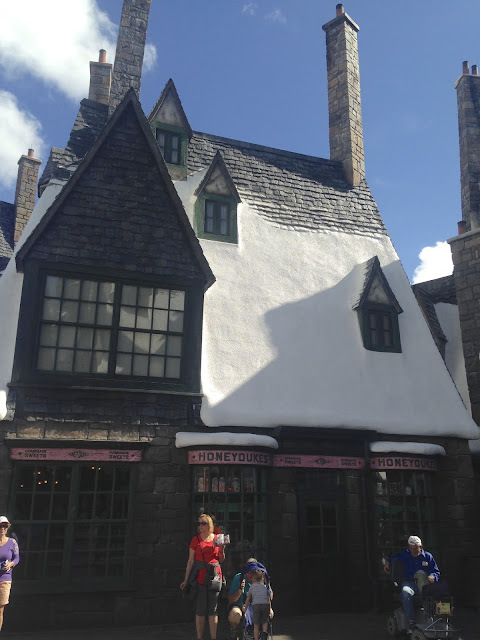 This is Zonko's Joke Shop, which was a favorite place for the Hogwarts Students to stop and buy prankster items to play jokes on their friends. I loved the rooftops of this village. Look at the crooked chimney on the right. Isn't that fun? 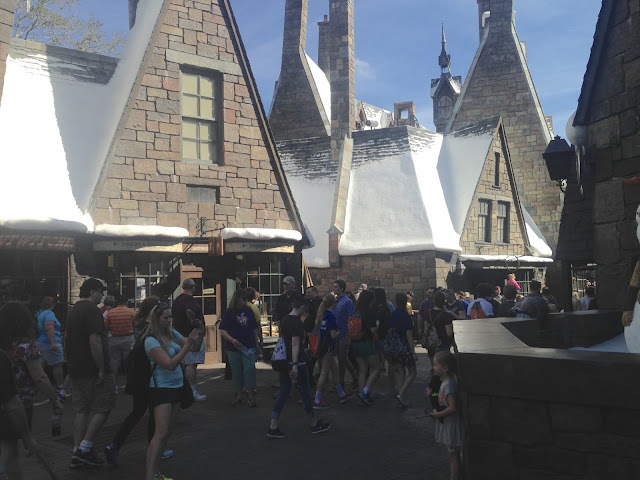 Even though there is so much else to do in the Islands of Adventure park, the Harry Potter part of the park was definitely the most crowded...I would say three or four more times crowded than any other part of the park. If you get the chance to go, either head straight there when you get inside the gate, or go later in the day when the crowds thin out and scatter elsewhere in the park. 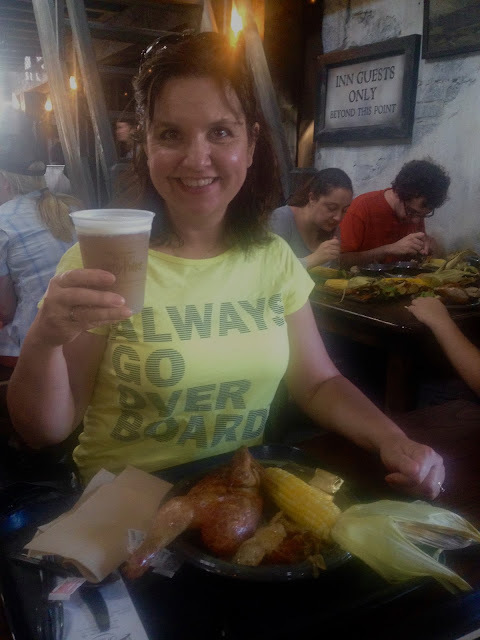 In a previous post, "What I Ate While Vacationing in Florida", I talked about the amazing meal I had at the Three Broomsticks Cafe. The food and ambiance were absolutely fabulous. Every where you looked, there were props from the Harry Potter movies. I loved the peaked roof and the spiral staircase. We got to sit right in front of the fireplace on the far wall. They serve both Butterbeer and Pumpkin Juice at the cafe. I got the Butterbeer and Jason had the Pumpkin Juice. Both were delicious, but I preferred the Butterbeer. They were expensive, at $6.00 a piece, but they were all so worth it! And no, the Butterbeer is not real beer. It is a delicious cream soda type beverage. 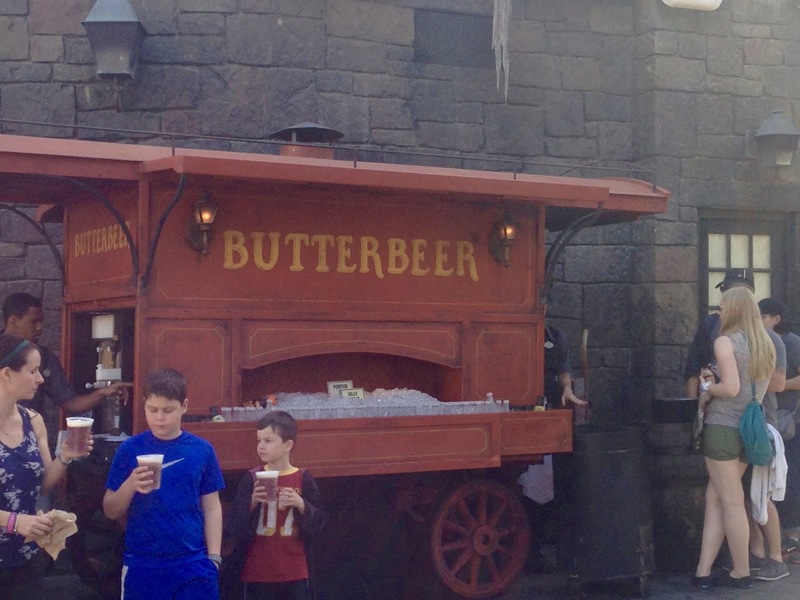 They also sold these drinks at several Butterbeer wagons outside. The lines were long and non-stop all day! 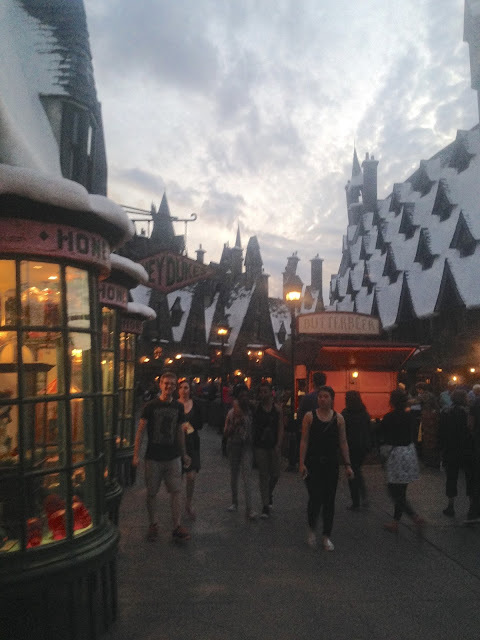 To walk through the Village of Hogsmeade is a feast for the eyes. There is just so much to look at. Every single window has a display from the movies inside of it. A music shop window display. Owls in cages display. I should mention that these displays are interactive as well. Some of the items in the windows move on their own, but others can be made to move by a wand. You purchase the wand for about $40.00 and then stand on a certain spot in front of the window display and say a 'spell' and wave your wand. Then something in the window happens. Now we didn't do that as $40.00 for a wand was a little too rich for our blood, but it seemed like every child in the village did purchase a wand so we just watched them have all the fun. Many of the stores in Hogsmeade Village are open for business and decorated with as much attention to the detail as the outside. Everything is made to look just like it does in the movies: dust, dirt, and even water stains on the ceiling included! These are all the wands in boxes on the shelves. They are for all for sale too! 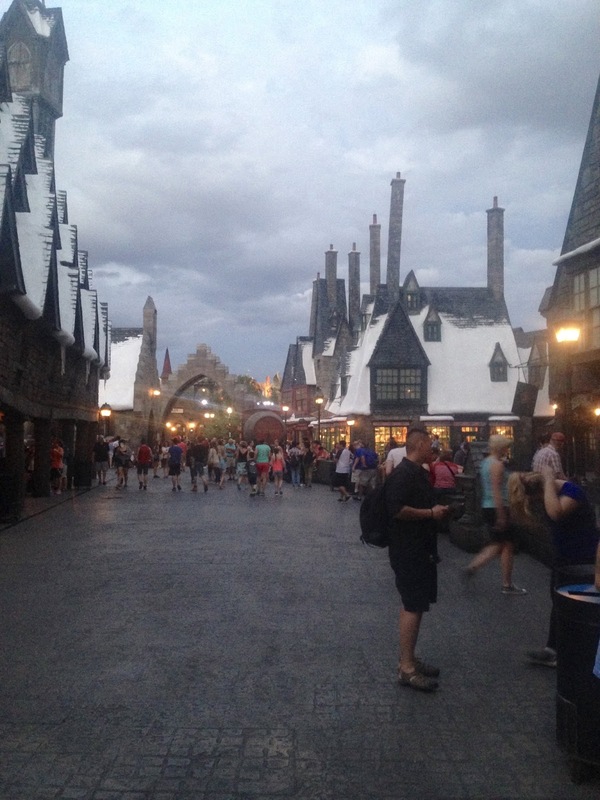 We had so much fun at Hogsmeade Village that after we toured the rest of the Islands of Adventure, we came back at night to see the village lit up. It was so beautiful! And as you tell by the photos, the crowds have definitely thinned out. You can actually see the window displays better at night because there is no glare from the sun. So what about you? 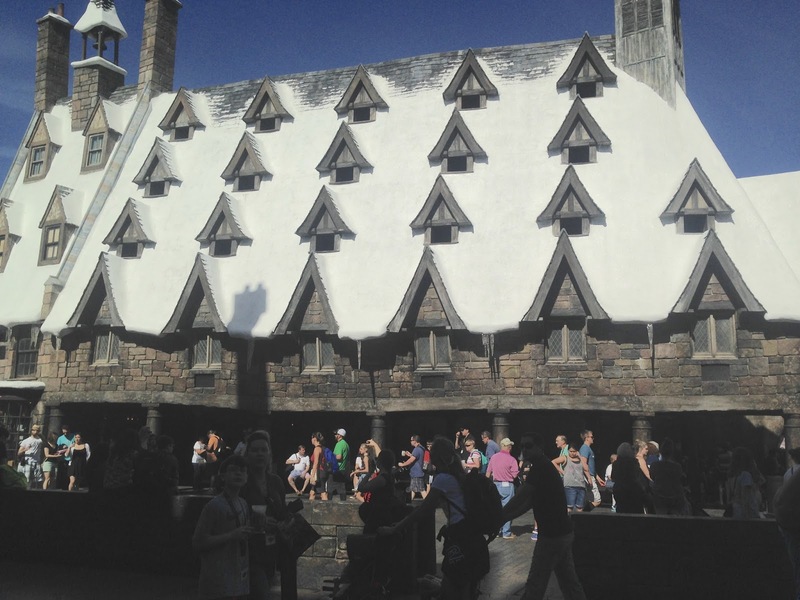 Have you ever been to the Islands of Adventure and saw the Wizarding World of Harry Potter? Would you like to go? Or are you not a Harry Potter fan? I have to admit, I really was not a Harry Potter fan until after I watched the entire movie series...but now I am. This was such a magical, wonderful place to visit! We were thrilled with being able to see this in person. Linking Up with these Fabulous Blogs HERE and Travel Tuesday! Believe it or not, I'm still working on my new "Beauty Room". There are so many finishing touches that still need to be done. My husband and I went antiquing this past weekend to look for items for the room. We didn't find any antiques, so we stopped at Home Goods and Kirklands on the way home, and picked up a lot of really great items that are just perfect for the room. I'm still on the lookout for two more wall hangings, plus I'm sewing pillows and a bed skirt....and then I'll be done. Whew! Someday this room will be finished. And if you have no idea what I'm talking about, you can catch up HERE, HERE and HERE. In the meantime, all the furniture is finally done! Yippee! That's what took the longest as there were two custom pieces of furniture (an end table and a bed), that my husband built and I had to slather with like four coats of paint! I want to wait until the big reveal to show you the bed...plus I'm still working on the bedding...but I will show you the end table today. When we originally planned this room, the wall immediately to the right was going to be custom shelving. But then I found this really cool chair at a thrift store, and one thing led to another, and it evolved into a new design. Well, once I had the chair in place, I had this empty spot that needed to be filled with something. We decided an end table would be nice, but I really wanted it be practical as well. It had to provide more storage since I lost one entire wall of storage in this new design. I needed a new way to store all my scarves as the current way I was storing them was not working. I had them hanging on hangers in our guest bedroom closet and they were constantly falling on the floor or getting wrinkled. Plus they were hard to find in a dark closet. When I was visiting my daughter in Florida, I saw she kept her scarves in decorative baskets, so decided to try that too! The first thing we did was look for and buy some nice baskets that we thought would look good in the room. They are a grey tweed fabric basket that we picked up at a home improvement store for around $10.00 each. All my scarves fit nicely in two baskets. From there, my husband and I worked on a design for an end table that would fit the two large baskets. Once we came up with something we could both agree on, off he went to build it! Isn't it pretty? It is such a simple design, but it's exactly what I needed and wanted. The best part about this table, is it only cost around $20.00 to make because most of it was made with refurbished wood. Here is what it looked like before I painted it. The bottom and middle table tops were made using our old kitchen cabinet doors. We remodeled our kitchen fifteen years ago, yet my husband still hung on to the old doors thinking someday he would have a use for them. The legs are also pine board scraps he had lying around from previous projects. The only wood he bought was the birch veneer top and the decorative molding you see on the legs. My new end table fits the space perfectly, and I love how my baskets look inside of it! Looking for a scarf to complete my outfit has now gotten so much easier. One basket contains winter scarves and the other basket contain summer scarves. When I'm looking for a scarf to complete my outfit, I first pull out the appropriate basket, then I simply lift up by the roll the colored scarf I'm looking for. So far, it's worked really well and my baskets haven't gotten messy at all! Well now that I had a cute new end table, I had to decorate it so of course I had to go shopping! I wanted something tall and was originally considering a lamp. But then I realized that I didn't need a lamp in that room as there is plenty of overhead lighting, so I picked up this orchid planter at T.J. Maxx for $20.00 instead. Next, I wanted a photograph of a glamorous, beautiful woman. I was thinking about looking for a black and white photo of Marilyn Monroe or Audrey Hepburn, but when I saw this photo of my daughter on my computer, I thought it couldn't be more perfect! She definitely is a glamorous, beautiful woman, and the color and style of her clothes match the room decor perfectly. All I had to do was buy a $1.50 silver frame at the dollar store, and I had a wonderful piece of personalized art. Finally, I thought a nice round or oval tray would really complete my pretty vignette....that's why we went antiquing! But when we couldn't find anything in the antique stores, we headed to Home Goods and found this beautiful silver and mirror tray for only $14.99! A fraction of the price they were asking for something in an antique store...and much prettier too! With the addition of the lovely silver tray, my vignette was complete. Notice how I used three levels of height, three items, and different shapes? Always work in odd numbers when putting together a vignette for your table tops. As a final touch, I put my mother's antique silver necklace and a strand of pearls inside the tray. I'm so happy with the way my room is turning out. I can't wait till it's officially complete and I can show you the entire room! Be sure to check out the "Between the Lines" blog series that features bloggers over the age of 50. 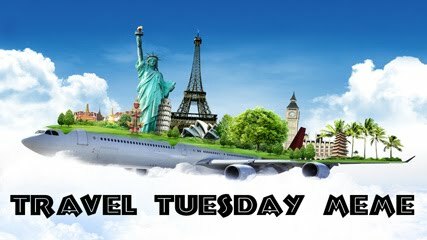 It started last week and will run every Tuesday until June 28th! Read this week's post HERE! My Garden is Coming to Life! A Black Moto Leather Jacket with Lavender Lace?